Last Saturday was Gay Pride in London. 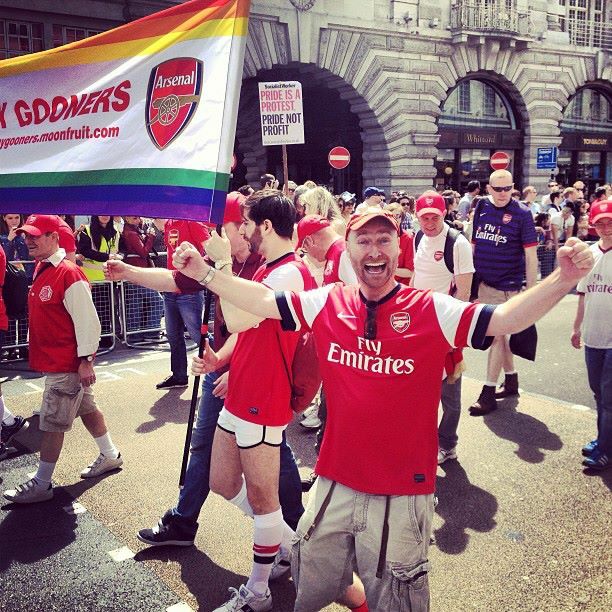 The recently formed Gay Gooners group were marching with the full support of the Arsenal Fooball Club. Naturally I went down to join them in my full replica kit and we all had a great time chanting and singing and feeling proud. I all but lost my voice by the end. Interestingly huge cheers went up from Arsenal fans both gay and straight. "Good on you" they shouted. "Arsene Wenger's Red Army we shouted back"
The odd boo (but good natured 'boo') from the watching crowd was generally from Chelsea or Tottenham Hotspur fans. I went over to them and guesturing to the march said, "Where are Spurs and Chelsea then?" and they nodded and agreed. "Next year" they said, "next year we should be here too." And they should. As long as we out nubmer them! An Arsenal fan first. Gay second. As it should be. Labels: Arsenal, Arsenal F.C., Arsene Wenger, Arsène Wenger, Chelsea F.C., Gay pride, London, Tottenham Hotspur F.C. Liverpool FC will be participating in the Liverpool Pride march on August 3rd too, following from last year's successful involvement! You can read about it here: http://therhivolution.wordpress.com/2013/07/22/lfc-support-liverpool-pride-2013/ - it makes reference to Arsenal's good work in the LGBT community too. Pride Gay jewelry is distinctive because it recognizes and supports the universal right to love whoever we choose.